For New Yorkers, car ownership adds one major headache: Where to park? Valet Anywhere eliminates the “Dude, where’s my car?” frenzy, transforming the way people own cars in the city. From within the Valet Anywhere app, subscribers request a valet. No cash changes hands as valets safely move clients’ cars from their destinations to secure and trusted Valet Anywhere partner parking garages. And when you want your car back, valets return it in a pinch, with an added carwash and full tank of gas as a bonus. To make their customers even happier, Valet Anywhere recently focused on making their premium service the safest it could be. With more than 200,000 collisions per year, NYC is a city that could definitely benefit from safer drivers. The effort began with Valet Anywhere teaming with Zendrive to improve safety for 17 selected valets over a two-month period. These drivers, which represented a quarter of the company’s fleet, began with lower than average control scores. Using smartphone sensors, Zendrive and Valet Anywhere measured drivers’ caution, control, and focus on the road—while detecting collisions. The goal of Valet Anywhere’s data-driven safety program was to move at least 60% of the pilot group of drivers from fair to excellent. After two months, Valet Anywhere exceeded this goal, experiencing a 76% increase in excellent drivers. 20% reduction in collisions, an estimated cost savings of a couple of thousands of dollars a month – According to a report from Network of Employers for Traffic Safety, on the job crashes cost employers more than $25 billion annually, with speeding costing employers almost $8.5 billion and distracted driving more than $8 billion. 30% reduction in hard braking and speeding – Valet Anywhere used Zendrive technology to decrease the average number of all risky driving events, with hard braking and speeding lowered by nearly a third. This translates into fewer tickets, less wear and tear on vehicles, and fewer collisions (lower speeding and hard braking are indications of near collisions). Reduced phone usage – Valet Anywhere saw a 4% focus score improvement after 30 days, which means more valets are putting down their phones in favor of safer driving. 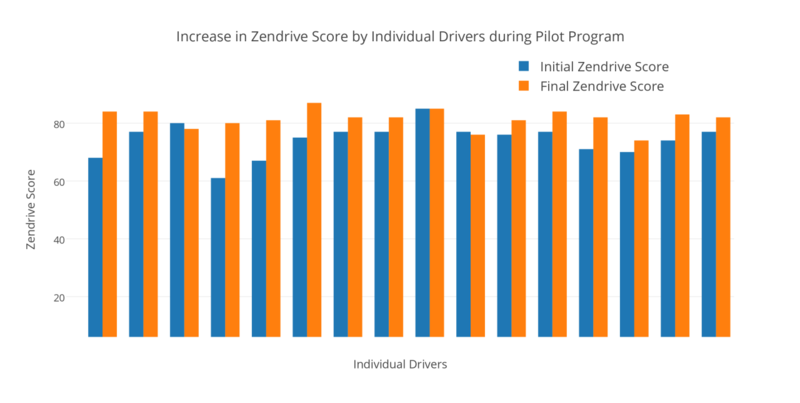 Increased Zendrive safety score – Valet Anywhere drivers demonstrated an average Zendrive score improvement of 10 points. Rebecca Weisz, Valet Anywhere’s HR generalist who supports Valet Anywhere’s driver training program reports that in addition to improving driver safety, Zendrive also changed the way new drivers are trained. “We tweaked our training to focus on routes that avoided highways and provided additional defensive driving training. We also discovered most risky events happened when valets were late to customers, so we stressed customer service, coupling better time management and safer driving skills,” says Weisz. Cars were always in good hands with Valet Anywhere’s experienced and highly trained valets, and now they’re in even better hands. “Safety and trust are big issues for new customers and prospects. People don’t mind paying a service premium for proven safety and Zendrive helped us demonstrate our commitment to the safety and care of their personal vehicles,” concludes Lee. If you’re frustrated with car parking in New York City, be sure to check out rapidly growing Valet Anywhere.